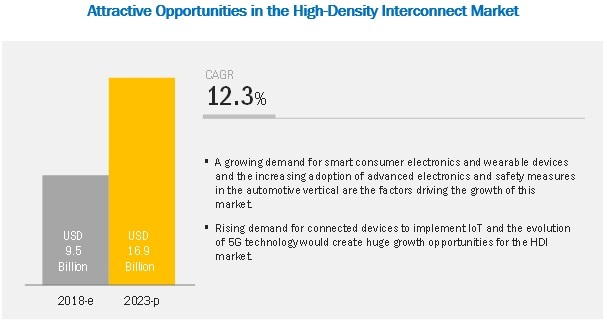 [130 Pages Report] The high density interconnect (HDI) market is expected to grow from USD 9.5 billion in 2018 to USD 16.9 billion by 2023, at a CAGR of 12.3% from 2018 to 2023. A few key factors driving the growth of this market are increasing adoption of advanced electronics and safety measures in the automotive vertical and growing demand for smart consumer electronics and wearable devices. The HDI market for 10+ Layers HDI is expected to grow at the highest CAGR during the forecast period. This growth can be attributed to 10+ Layers HDIs being used in a wide range of devices, such as high-reliability automotive products, high-density mobile devices, and IoT modules. 10+ layers HDI offer benefits such as small size, lightweight construction, and enhanced flexibility. The HDI market for wearable devices is expected to grow at the highest CAGR during the forecast period. HDI PCBs possess technical characteristics of extremely high density routing interconnections and make the high density of components possible. These attributes contribute to the high performance and lightweight of HDI boards that make them ideal for powering wearable devices. APAC will likely account for the major share of the global HDI market in during the forecast period. This growth can be attributed to the increasing application of HDI in consumer electronics, automotive, and healthcare verticals in countries such as China, India, and South Korea. It is also due to the extension of telecommunications networks in China, Thailand, Malaysia, South Korea, India, and other developing countries in APAC. Unimicron (Taiwan) manufactures and sells PCBs and IC carrier products in Taiwan and internationally. The company offers rigid PCBs, including HDI boards, every layer interconnect (ELIC) or any-layer HDI PCBs, buried bump interconnection technology, FPCs, multi-layer PCBs, heavy copper PCBs, backpanel/high layer count PCBs, and rigid-flex PCBs. These products are used in smartphones, tablets, ultrabooks, e-readers, MP3 players, global positioning system (GPS), portable game consoles, camcorders, and liquid-crystal display (LCD) modules among others. To grow in the HDI market, the company believes in providing leading-edge products. Its goal is to build its core competence based on technology innovation and intellectual properties. For this purpose, Unimicron has developed partnerships with Tier 1 materials and equipment suppliers. The company participates in product and technology development projects in domestic and international research institutes; there are cooperative projects with research institutes like IZM (Germany) and Georgia Institute of Technology (US). In April 2018 TTM Technologies (US) acquired Anaren (US), a designer and manufacturer of high-frequency RF and microwave microelectronics, components, and assemblies. This acquisition is expected to enhance the company’s RF products designing capability (for aerospace & defense), deepen its customer engagement in aerospace & defense and networking/communications verticals, and complement its focus on high-technology PCB products manufacturing. In February 2018, AT&S (Austria) expanded the Fehring plant in Austria with an investment of USD 11.7 million. Under this expansion, the plant received a significant technological upgrade to start the production of high-end PCBs, primarily for the automotive sector, from March 2019. PCBs for medical applications will also be produced. In October 2017, AT&S expanded its technical competence with an investment of around USD 46.8 million. The project was planned to produce high-frequency PCBs for autonomous driving applications at the existing sites in India and Austria. What are the major applications of HDI PCBs? Which region would lead the global HDI market during the forecast period? What are the strategies followed by HDI PCB manufacturers to stay ahead in the market? What are the major drivers, restraints, opportunities, and challenges for the HDI market? The study involved 4 major activities in estimating the size of the high density interconnect (HDI) market. Exhaustive secondary research has been done to collect information on the HDI market. Validation of these findings, assumptions, and sizing with industry experts across value chain through primary research has been the next step. Both top-down and bottom-up approaches have been employed to estimate the complete market size. After that, market breakdown and data triangulation have been used to estimate the market size of segments and subsegments. In the secondary research, various secondary sources have been referred to for identifying and collecting information important for this study. Secondary sources include corporate filings (such as annual reports, investor presentations, and financial statements); trade, business, and professional associations; white papers, PCB–related journals, and certified publications; articles from recognized authors; gold and silver standard websites; directories; and databases. Few examples of secondary sources are the American National Standards Institute (ANSI), European Institute of Printed Circuits (EIPC), International Microelectronics and Packaging Society (IMAPS), Surface Mount Technology Association (SMTA), and The Institute of Electrical and Electronics Engineers (IEEE). In the primary research, various primary sources from both the supply and demand sides have been interviewed to obtain the qualitative and quantitative information for this report. Primary sources from the supply side include industry experts such as CEOs, VPs, marketing directors, technology and innovation directors, and related key executives from major companies and organizations operating in the HDI market. Following is the breakdown of primary respondents. After arriving at the overall market size using the estimation processes explained above the market has been split into several segments and subsegments. To complete the overall market engineering process and arrive at the exact statistics of each market segment and subsegment, data triangulation and market breakdown procedures have been employed, wherever applicable. The data has been triangulated by studying various factors and trends in both demand and supply sides of the HDI market. This report categorizes the HDI market based on product, application, end user, and geography.